Boston Red Sox president and CEO emeritus Larry Lucchino speaks to The Japan Times on Tuesday in Tokyo. 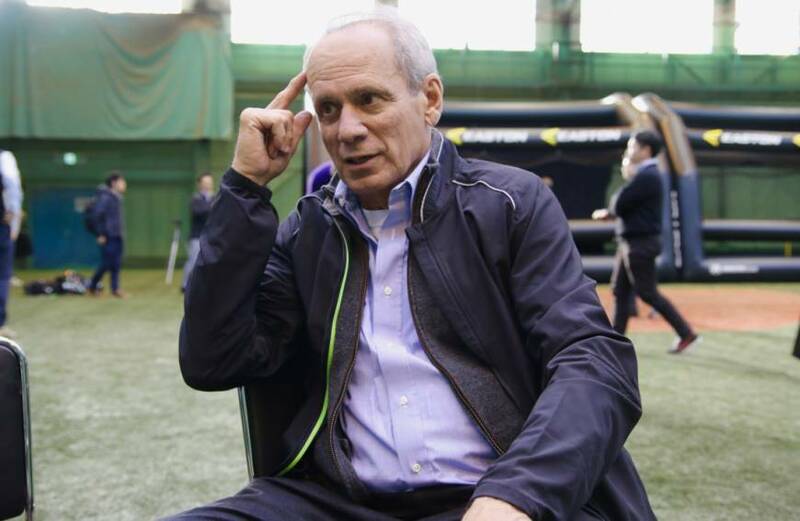 Larry Lucchino is very comfortable in Japan and it’s no wonder why. Lucchino presided over one of the most successful periods in the history of the Boston Red Sox franchise, as the team’s president and CEO from 2002-2015, and many of the Japanese players he helped bring on board played a role during those years. Lucchino has the time to visit Japan more often if he wishes, since he stepped down from his position with the Red Sox after the 2015 season. Lucchino was previously an executive with the Baltimore Orioles (1988-1993) and San Diego Padres (1995-2001) before joining the Red Sox in 2002. His 14-year tenure in Boston came with three World Series championships, including the 2004 triumph that broke the 86-year “Curse of the Bambino,” the club’s infamous title drought. He was named Red Sox president and CEO emeritus effective Oct. 16, 2015. He’s in Japan this week in his role as a board member of Performance Sports Group, the parent company of Easton, which on Tuesday announced it was entering the Japanese market. “This is my second year on the board and I’m able to recognize some of the advantages that Easton has in terms of research and development because I’ve spent a lifetime in baseball,” Lucchino told The Japan Times. He knows a thing or two about Japan, having made many visits to the country, including in 2008, when the Red Sox opened the MLB season against the Oakland Athletics at Tokyo Dome. In addition to Matsuzaka, Tazawa and Uehara, the Red Sox also brought in Hideki Okajima and Takashi Saito (a player who, like Uehara, came from another MLB club) during the Lucchino years. The club employed full-time translators and even a Japanese chef to make the players feel more comfortable. Lucchino said Japanese players — past, present and future — face a number of issues when they make the jump to the major leagues. He also noted the challenges players and teams sometimes face when cultures collide. “There’s a question, always, on the baseball side: do you let him play and pitch and practice the way he did in Japan, or do you encourage him to adjust to American methods,” Lucchino said. “Sometimes, we’ve done both. I don’t know which is the answer, maybe it’s an individual issue. These days, Lucchino, 70, is plotting his path as he moves into the next phase of his life and career. In January, Lucchino was announced as one of the members of the 2016 class of the Red Sox Hall of Fame. He’s also working as chairman of the Pawtucket Red Sox, the team’s Triple-A affiliate. That role hasn’t been without some controversy, mainly stemming from a plan by the club’s new ownership group to move the team from Pawtucket, Rhode Island, to a new site in downtown Providence, the state’s capital. That plan died in September. The PawSox began the process of reconciling with Pawtucket fans in an open letter, co-signed by Lucchino and Pawtucket mayor Donald Grebien, that was published Monday. “I think that we’ve pressed the restart button in trying to take a fresh look at Pawtucket and McCoy Stadium, and to try to run the team more successfully this year,” Lucchino said. “It’s been in a bit of a decline in recent years.